In April I was asked to make a quilt for the JJ Knox Connection to use as a fund raiser. JJ Knox was the name of the Black High School in Winona, MS before segregation ended. Once schools were integrated, my understanding is that, JJ Knox School was not in use as a school and burned at some point. The graduates and the Winona community as a whole are working to beautify the grounds and commemorate the graduates, many who have gone on to make major contributions to the area and nation. 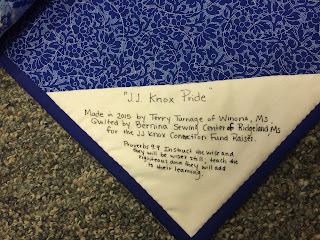 Click here to read more about it and to read about the history of JJ Knox School. I knew the big fund raiser would take place on Labor day weekend, which does not give too much time, given that most long-armers have a two month waiting list. 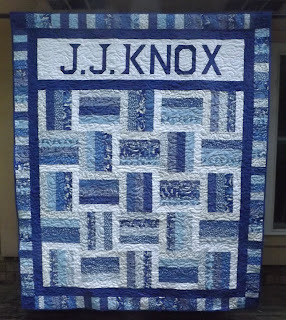 I was given the idea to use the JJ Knox school colors of royal blue and white. I knew the design would have to be fairly simple or it would be too difficult to get it in on time. About that time Missouri Star had a deal of the day on a Blue and White jelly roll. I put my order in and then the next weekend took it to Main Street Fabrics in Ackerman to find a backing, solid royal blue and solid white fabric. They had just what I needed and gave me a discount since I am a MQA member. I dropped the top off the first week of June and crossed my fingers. I used the left over strips to make a piano keys border. Some of the lettering is paper pieced and some is pieced using half square triangles and strips. The quilt is approximately 60 x 70 or 72...I can't remember the length and I did not write it down. I got the quilt back from the long armer the first week in August!! Whew...just enough time to get the binding on and a hanging sleeve!! The big fund raiser, where they will sell raffle tickets, will be Saturday, September 5, here in Winona, MS. If you happen to be in the area and would like one, come on by and join in the celebration. Sorry all the summer got ahead of me and we have been back at it in school for three weeks. So it is time to get into a routine and start back with routine posts and getting life in general on track. 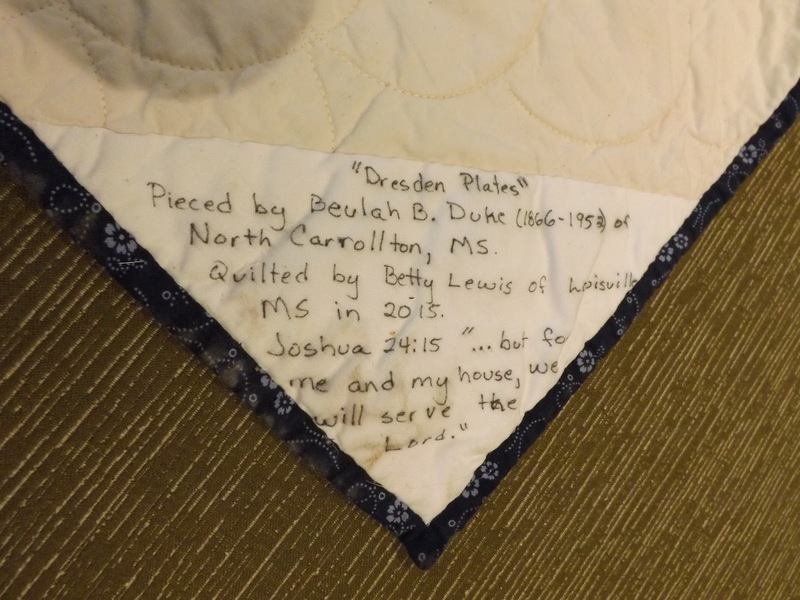 Last fall I took three antique quilt tops to Betty Lewis to quilt. They were tops made by my sister-in-law's (Anne Sanders Turnage) great grandmother Buelah Duke. I assembled backs before taking them and bound and labeled them upon picking them up. I delivered the last one to them on Jeff's (my brother) birthday. I must say I am so pleased with the way they came out. The tops were in great condition. They had been stored in a cedar chest for about 50 or more years. They all laid very flat and were in good shape. Betty did a nice job with the quilting and I picked them up about a week or two before the time school got out and started binding them. 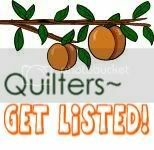 It would have been nice to hand quilt them myself or pay for hand quilting, but the price was prohibitive and I felt it would be better to be a quilt and go for a long arm overall design. And it would be too long in the delivery if it was up to me to hand quilt them. As Bonnie Hunter says it is better to have a quilt than a flimsy, even if it is not historically correct. This pattern was called Garden Patch so I renamed it Pink Garden Patch. I asked Betty to put a Daisy flower pattern on it. Dresden Fans Clam shell quilt design. Sting quilt got a loopy design.